European Union leaders renewed their vows at a special summit in Rome on Saturday, celebrating the troubled bloc's 60th anniversary. ROME: European Union leaders renewed their vows at a special summit in Rome on Saturday, celebrating the troubled bloc's 60th anniversary with a commitment to a common future without Britain. With British Prime Minister Theresa May absent, the other 27 countries signed a new declaration on the Capitoline Hill where six founding states signed the Treaty of Rome on March 25, 1957. Pro- and anti-EU protests took place in Rome, while in London tens of thousands of people marched against Brexit, which May will trigger on Wednesday. With the EU facing a string of crises on top of Brexit including migration, a moribund economy, terrorism and populism, EU President Donald Tusk called for stronger leadership. "Prove today that you are the leaders of Europe, that you can care for this great legacy we inherited from the heroes of European integration 60 years ago," Tusk said. After welcoming the leaders to the Renaissance-era Palazzo dei Conservatori, Italian Prime Minister Paolo Gentiloni said: "We have had 60 years of peace in Europe and we owe it to the courage of the founding fathers." The original Treaty of Rome was signed by Belgium, France, Italy, Luxembourg, The Netherlands and West Germany to create the European Economic Community (EEC). 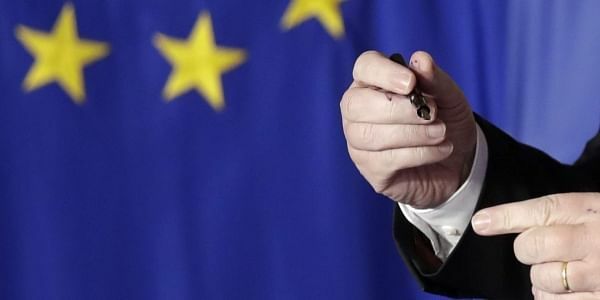 The new Rome Declaration that the leaders signed, using the same pen that was used six decades ago, proclaims that "Europe is our common future" in a changing world. But it also enshrines for the first time a so-called "multi-speed" Europe, in which some countries can push ahead on key issues while others sit out, an idea pushed by France and Germany but opposed by many eastern EU states. French President Francois Hollande said the message from Rome was, "we're stronger together," while German Chancellor Angela Merkel said that "a Europe of different speeds does not mean at all that there is no common Europe". European Commission chief Jean-Claude Juncker insisted the EU could ride out recent storms. "Daunting as they are, the challenges we face today are in no way comparable to those faced by the founding fathers," he said, recalling how the new Europe was built from the ashes of World War II. The leaders met with the words of Pope Francis ringing in their ears -- on the eve of the summit, the pontiff warned that without a new vision, the crisis-ridden bloc "risks dying". The White House meanwhile congratulated the EU on its 60th birthday in a notable shift in tone for President Donald Trump's administration, whose deep scepticism about the bloc has alarmed Brussels. But the British premier's absence, four days before she launches the two-year Brexit process, and a row over the wording of the Rome declaration underscored the challenges facing the EU. Greece, currently wrangling with the eurozone over getting more cash from its latest bailout, was the key country holding up approval of the document, by insisting on a mention of social benefits. Polish Prime Minister Beata Szydlo, fresh from a bitter row over former premier Tusk's re-election as EU chief, only agreed to sign at the last minute due to objections over the reference to a "multi-speed" Europe. Symbolising the divisions, rival demonstrations for and against the EU took place in Rome, watched by a heavy police presence. "I was a girl during the war and this grand European movement has become my political ideal," Catherine Chastenet, a 74-year-old marcher from Paris, told AFP. In London, around 80,000 people took to the streets to call for Britain to stay in the bloc with a sea of blue EU flags stretching out from Trafalgar Square. "I was told I could settle down, marry a Brit and make my life here. Yet today I am told I'm a foreigner and should go back where I come from," said Joan Pons, a Spanish nurse who has lived in Britain for 17 years. In Poland, thousands of Poles sang the "Ode to Joy" European anthem as they waved Polish and EU flags at rallies organised by the liberal opposition in dozens of cities and towns nationwide.